The delicious instant mix that enables you to prepare a superb dessert even when you're in a rush. Altromercato's vanilla budino mix is made with organically sourced ingredients without any added colouring or preservatives. 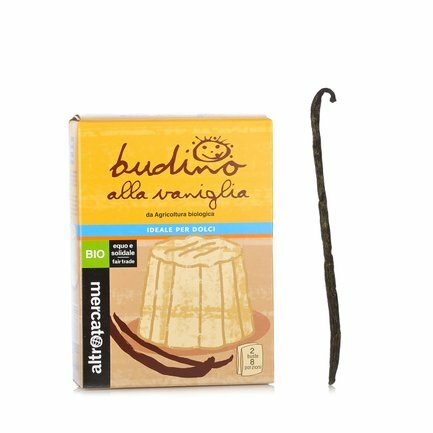 But the key ingredient is vanilla, grown by local farmers in Italy working in the fair trade industry in the state of Karnataka. Just follow the easy instructions on the box to make a tasty, light and intensely fragrant dessert. Ingredients *°Cane sugar - °Maize starch - *°Low-fat cocoa powder (19 %) - Thickening agent: carrageenin - Salt. *Total Fairtrade ingredients: 71% ° Organic ingredients. The product does not contain genetically modified organisms. For more information on product labels, please contact our Customer Service department. The information on the labels of the products may vary for reasons beyond our control, therefore, there may be discrepancies between the information on the site and that on the products delivered. Please always check the information on the product before consumption or use.